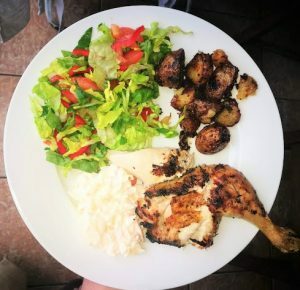 I came across this Spatchcock recipe and decided to try it. But of course being me I had to use any excuse I could and finish it off on the BBQ. It was incredible! Crispy tasty chicken skin while the meat remained juicy and moist and full of flavour. I threw it together with a salad from veg we had in the fridge and made a homemade French dressing to top it off. And for one more burst of flavour I cooked the baby potatoes in the fat of the chicken. All of it finger licking good. The plates were clean at the table that day! 1) Blend with the back of a spoon the minced garlic and salt. 2) Add the thyme and butter and stir until combined. 3) Take your chicken and turn it over. Find the back bone and using a meat scissors cut along either side of the bone. 4) Flip it back over and place in a roasting dish. Using the heel of your hand push down onto the center of the chicken until it flattens or butterfly’s out. 5) Spread 80% of your butter mix onto the entire skin of the chicken and place in a pre heated oven of 220 for 10 mins. 6) Take it out, add your spuds or veg whatever you like in now and return to the oven reducing heat to 190 for 20 more mins. 8) When it’s done, separate your veg/spuds and put chicken carefully onto the pre lit BBQ FOR 4-5 mins and give it that beautiful finish and crispy skin. Put all your ingredients in an old honey jar, put on the lid and shake! and the spuds and drizzle your dressing. 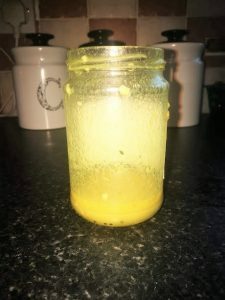 The dressing will keep in the fridge sealed for up to 2 weeks.